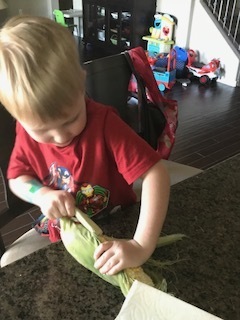 Two years ago, I wrote about my almost-2-year-old attempting to shuck corn. Well, here I am just a few weeks away from my son's fourth birthday, and a few weekends ago, we noticed that fresh corn was out at our local market. He was very excited to add it to our cart — and eager to help prepare it. And WOW, what a difference two years have made! This year, he could deftly rip the husk off without any help. And yeah, sure, it was messy, but honestly, he was no less messy than I would have been on my own. He also loved helping to season the corn and wrap it in foil before we threw it on the grill. And more importantly, he loved eating it.